1. That which causes an object to become obdurate or a person to become insensitive and unresponsive: Dissolved minerals are petrifiers which can change plant material into a fossilized form, but only after an exceedingly long time! A very strong fear of heights can be a petrifier for some people causing them to be completely paralyzed during the experience. A reference to "petroleum" or the "petroleum industry": Jack took his car to the petro station to get some gas. An area where species are living on or among rocks or stones: Chaotic though a bird petrobiont may appear, it is considered to be an organized, orderly community, where each kind of feathered animal has its own preference as to which location it will have for its nesting on the cliff. As harsh as the conditions of life on a rocky shore may seem to a human observer, the birds obviously thrive and multiply in their petrobionts. Mountain goats exist in their special petrobionts and have adapted to dwelling among the rocky formations as mountain climbers! Relating to living in rocky habitats: One example of petrobiontic areas are mountains which are homes for many different forms of life, including various plants and animals. 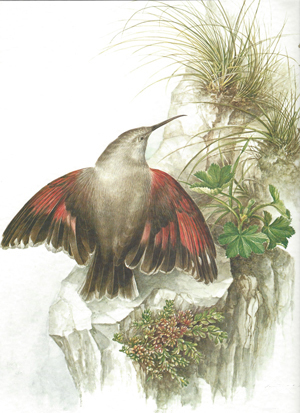 —Source: Natur-Palette , Zurich Insurance Calendar, 1991. Descriptive of vegetation and animals that exist in rocky areas: Just beneath the rims of Grand Canyon, there are bighorn sheep feeding on grass and also scorpions, tarantulas, and black widow spiders petrobiontly hiding out in the cool, shadowy cracks of rocks. There are also wild birds that include hawks, eagles, ravens and falcons petrobiontly nesting and flying in the canyon's air currents. A substance that comes from oil or natural gas; such as, gasoline or kerosene: Examples of petrochemicals include ammonia, acetic acid, and ethanol. Creatures which prefer to live in areas with stones or boulders: There are conditions when scorpions are petrochthophiles because they are lithophilic or rock-loving creatures; so, they inhabit many geographic regions. In biology, a reference to creatures that thrive on rock-banks: The petrochthophilous Eurasian eagle-owl is a bird of prey that breeds on rocky cliff ledges. An organism which lives in stony or craggy environments: The main habitat of the wild yak, which is a petrochthophily, is in treeless regions between 3,000 and 5,500 meters (9,800 and 18,000 ft). Plants that grow on rocky or stony slanting areas: Jack and Jill had a wonderful time walking among the petrochthophytes that were growing among the boulders. Concerning inhabiting lapideous or stony terrain: The petrocolous alpine chickweed is a flowering plant that is usually grown in rock gardens. An organism that subsists in an area or clearing of stones or boulders: Petrodophiles, such as, the alpine azaleas, populate high mountainous regions of North America and are low-growing plants.